Delicious, antioxidant-rich raspberries will be a welcome treat when added to your supply of dehydrated survival foods. 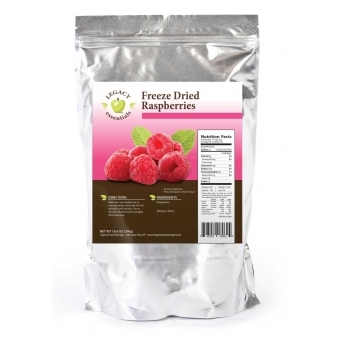 Legacy Essentials freeze dried raspberries are better than a fresh supply because they last longer and you can enjoy them any time of the year. Delicious, antioxidant-rich raspberries will be a welcome treat when added to your supply of dehydrated survival foods. Emergency freeze dried raspberries and other fruits/veggies add balance to your emergency food supply, providing essential vitamins and minerals that will help keep your family healthy while in survival mode. Rehydrate by simply adding water. Incorporate freeze dried raspberries and other deluxe snacks into your emergency survival foods supply. Raspberries are perfect for small hands and make up a delicious and nutritious emergency treat. Soak freeze dried raspberries in water for 6-8 minutes or eat straight from the bag. Enjoy yummy raspberries alone or add to trail mixes, cereal, oatmeal or smoothies. A supply of raspberries will also come in handy for a healthy topping on pancakes, pie or ice cream. Legacy Essentials emergency foods are wholesome, convenient and affordable. Our freeze dried survival foods offer generous portions and fantastic prices. Your survival food supply should provide the nutrition you and your family will need to survive an emergency situation, no matter how long it lasts. Freeze dried raspberries and all emergency survival foods have a twenty-five year shelf life. Add one cup raspberries to one cup water and soak for 6-8 minutes until tender. Use as desired. May be eaten straight from package.